Born near Mount Forest, Ontario on 13 February 1873, son of Joseph Batho and Mary A. Hayward, he was educated in the schools of Wellington County. He learned the printing trade at Mount Forest and, for a time was editor and joint publisher of a local paper at Grand Valley, Ontario. He came to Manitoba in 1897 and farmed at Austin. Later he published and edited a newspaper at Reston. As a travelling representative and correspondent for the Nor’West Farmer. he spent four years travelling over the three prairie provinces. He was later in charge of the paper’s circulation department, then as of February 1903 was editor-in-chief for thirteen years. 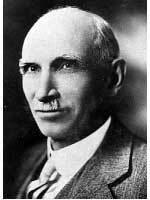 Around 1916, he was appointed editor of agricultural publications for the Manitoba Department of Agriculture and was later given responsibility for compiling agricultural statistics for the province. On 6 October 1903, he married Margaret Adeline Robertson (?-1956) at Pipestone. They had two sons: Elgin Robertson Batho (b 1904) and Bruce Batho. He served as President and Director of the Manitoba Horticultural and Forestry Association, and was a member of the Broadway Baptist Church. In 1925, he lived in Suite 19B, 778 McMillan Avenue, Winnipeg. In July 1947, he and his wife moved to Pittsfield, Massachusetts where he died on 31 January 1948 and was buried. In 1986, his name was added posthumously to the Honour Roll of the Manitoba Agricultural Hall of Fame. Social note, Winnipeg Free Press, 21 June 1947, page 11. “George Batho dies, aged 75,” Winnipeg Free Press, 2 February 1948, page 22. “Former Winnipeg editor’s wife dies in U.S.,” Winnipeg Free Press, 24 November 1956, page 25.